For National Poetry Month – Joyce's mystery and fiction book reviews with some non-fiction too! I learned about this one from BookPage. It sounds like a great resource for learning more about poetry in a very non-intimidating way. Seems like one worth thinking about during poetry month. No literary form is as admired and feared as poetry. Admired for its lengthy pedigree—a line of poets extending back to a time before recorded history—and a ubiquitous presence in virtually all cultures, poetry is also revered for its great beauty and the powerful emotions it evokes. But the form has also instilled trepidation in its many admirers mainly because of a lack of familiarity and knowledge. Poetry demands more from readers—intellectually, emotionally, and spiritually—than other literary forms. Most of us started out loving poetry because it filled our beloved children’s books from Dr. Seuss to Robert Louis Stevenson. Eventually, our reading shifted to prose, and later when we encountered poetry again, we had no recent experience to make it feel familiar. But reading poetry doesn’t need to be so overwhelming. 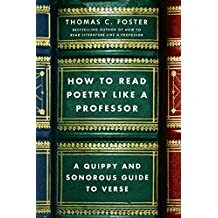 In an entertaining and engaging voice, Thomas C. Foster shows readers how to overcome their fear of poetry and learn to enjoy it once more. • How to read a poem to understand its primary meaning. • The different technical elements of poetry such as meter, diction, rhyme, line structures, length, order, and regularity, and how to learn to see these elements as allies rather than adversaries. • How to listen for a poem’s secondary meaning by paying attention to the echoes that the language of poetry summons up. • How to hear the music in poems—and the poetry in songs! With How to Read Poetry Like a Professor, readers can rediscover poetry and reap its many rewards.